To tell the truth, I spend a lot of time at work but I always do my best to have the time for my house chores. I am a woman and I like cleanliness and order. Most of all, I like cooking. A famous quote says, 'Love knows no age'. And it is a best illustration for considerable age gap relationships between people. As usual such relationships start from acquaintance on dating sites where people of different generations and cultures have a great chance to overcome all the possible barriers. The major part of men start looking for lasting relationships being already financially secured and established in their lives and career. But the ladies have family and children on their minds much earlier. 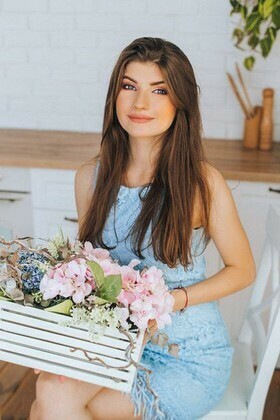 Many young women on UaDreams.com site are interested in meeting and getting married, they are quite eager to date senior foreign men who have already achieved a lot in their life and developed a strong family orientation. In our experience we assisted many happily married couples including those who had 10, 15, 20 and more years age gap in relations. I dream of a man who will love me and who will be glad to receive my love. Also want to develop myself as a person! Of course, one of my goals is to bring up a son with a wonderful person and to give him life values! Another one is to see some new places and cultures! I wake up early in the morning, exercise, take a shower, then cook breakfast for myself and my son! :)) I see my world good, quiet, calm and balanced. Also, I am open for communication, creative, talented, and neat. Age Gap Dating site. How to use. So, can age gap relationships work and what are the main advantages of an age gap marriage? Apparently, age difference can cause some challenges in relationship, one shouldn't focus too much on it. As the ladies get emotionally mature much earlier than men, male's and female' age gap gives an excellent foundation for a perfectly balanced relationship. On top of offering financially secure partnership a senior man will obviously impress the younger lady with the depth of his experience and richness in spiritual and emotional aspects. A younger half won't let her older partner feel bored or fall behind the times. Besides, the young lady will put lots of efforts in making her appearance more attractive and classy for her chosen one. And he in return will give even more attention to his own looks and physical shape to be on a par with a vibrant, full of life partner.